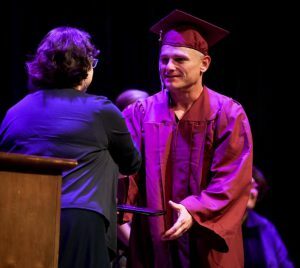 DOVER — In this the season of graduations, one was held on Thursday night at Dover High School that held special significance for those receiving diplomas. This was graduation day for students of the Dover Adult Learning Center. “What makes DALC graduation so special is that everyone walking across the stage tonight was uncertain as to whether this day would ever come,” said Deanna Strand, DALC’s executive director. The Frederick C. Walker Auditorium was filled with more than 400 friends and family members who came to help celebrate this life changing event. There are many reasons why people have taken advantage of this opportunity through the DALC.